I've been checking out a fun challenge by Taheerah lately, and I finally had time to play along today. I love her inspiration photos...see for yourself! I looked at all of the details in this photo - and there are many - before deciding what elements really caught my eye. The art deco design on the headboard was the first thing I saw, so my eye kept coming back to that piece. I was also drawn to that whimsical, bright pink chicken in the frame above the bedside table. 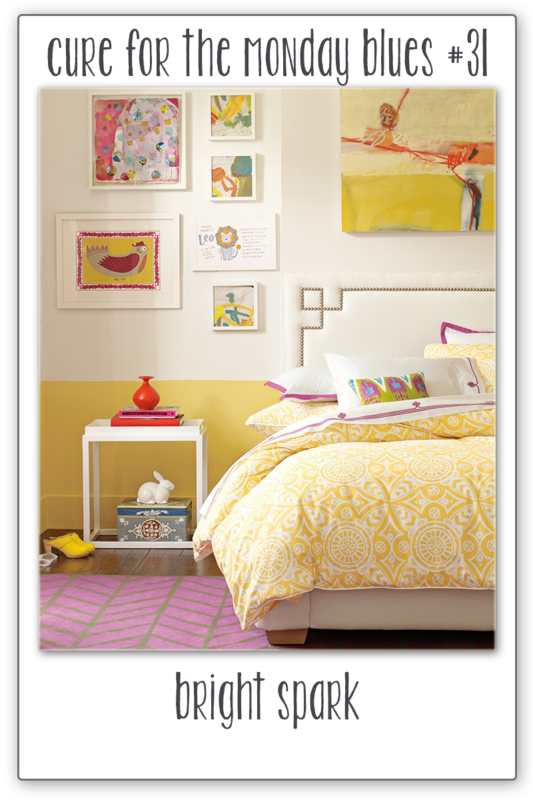 Then, of course, the yellow and white pattern of the comforter. Anyway (rather long winded, aren't I? ), this is how I combined those elements. It's fairly easy to see the elements I mentioned above. See that bright pink bird standing in the nest? My version of the pink chicken in the inspiration photo. I couldn't resist...she was just so much fun. Thanks so much for looking. I hope you'll leave a comment! Absolutely beautiful, as all your cards are. I love the brightness of this - very very pretty. Yay, welcome to my challenge Susie! I'm so happy to see you enter for the first time! I really enjoyed reading about where you took your cues - I always try to pick inspiration pieces that can be interpreted in many ways so it's always of interest to me where people choose to pull their interpretation from! Love the deco frame and the perfect stamping of the bird and branch and leaves! Thanks so much for playing to find a Cure For The Monday Blues!